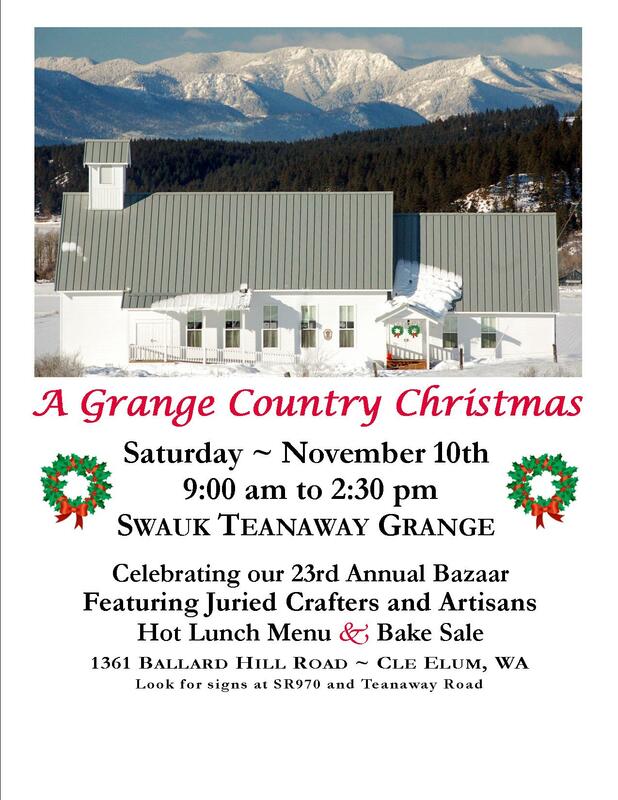 Come out to the Swauk-Teanaway Grange for our 23rd annual Christmas Bazaar & Bake Sale on Saturday, November 10, from 9:00 am to 2:30 pm. We have invited a select group of juried crafters and artisans offering a wide variety of unique and handmade items. We’ll be serving savory soups and crusty bread on our hot lunch menu and lots of home-baked goodies on our Bake Sale tables. Come by to shop and stay for lunch in our expanded seating area. Admission and coffee are FREE! The Hall is located at 1361 Ballard Hill Rd, Cle Elum, WA. Take SR970 to Teanaway Rd, go right at Ballard Hill Rd, the Grange will be on your left. Questions? Call Joyce Dunbar at 509-968-3606.